The most affordable and flexible way to make and receive calls over the internet anywhere! Free OneSuite App for iPhone/iPad or Android! 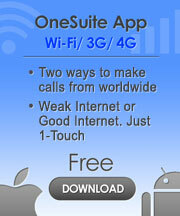 Free OneSuite softphone download for PC or Mac! A powerful phone service to make cheap calls and receive unlimited calls using our free smartphone app, free computer softphone, or BYOD! Enjoy free unlimited voice mails! No hidden fees: No setup fees! No contracts!